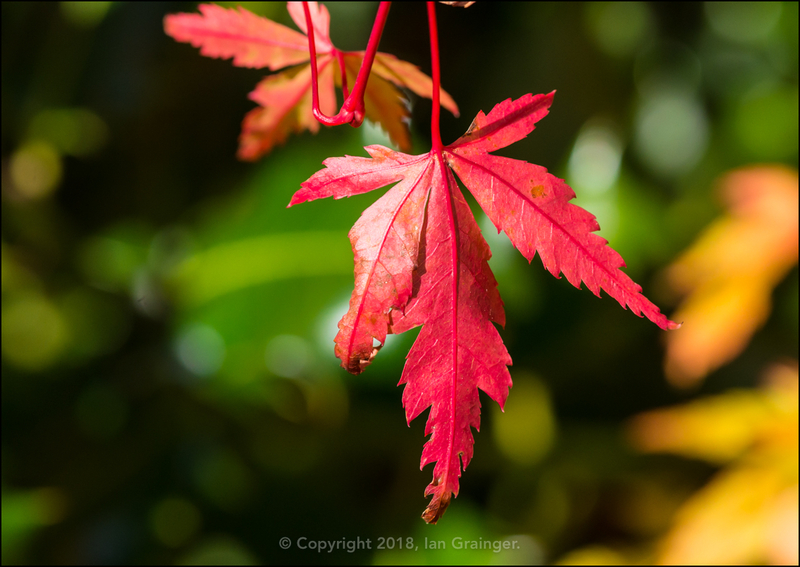 It was a beautiful blue skied morning for my photo shoot in dad's garden this weekend, and although a little chilly, thankfully the wind and rain stayed away. 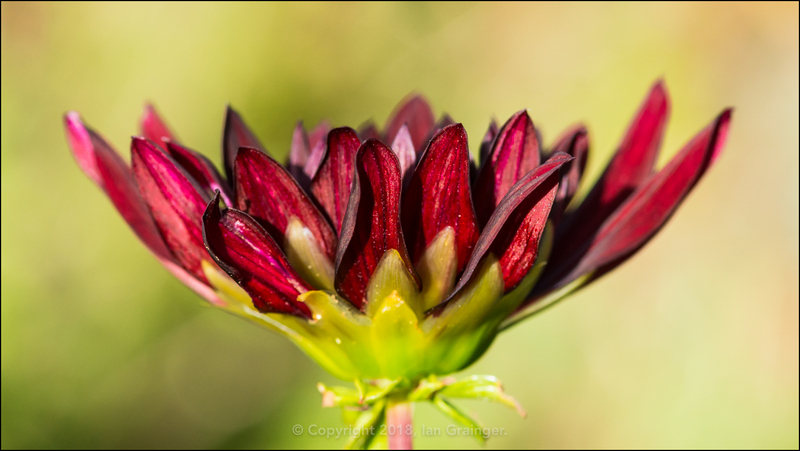 The wind from a couple of weeks ago had completely decimated the Dahlias, so it was nice to see that some of the flower stems had recovered and their buds had begun to open again. 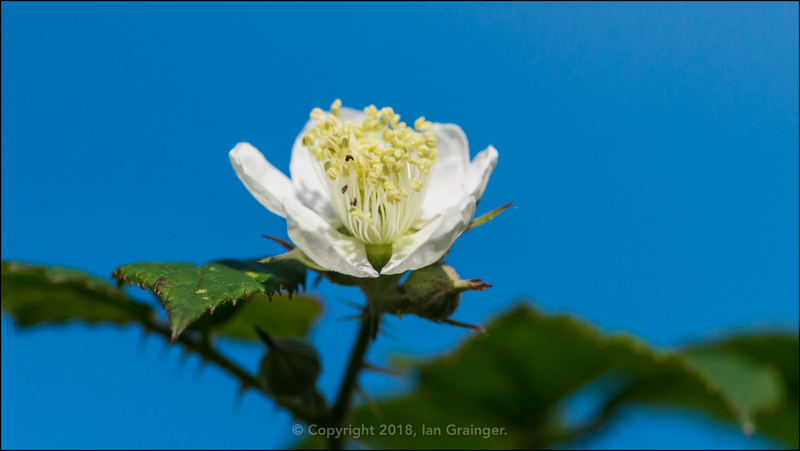 The beautiful blue sky was a perfect foil for this Bramble (Rubus fruticosus) bush bloom, and the petals positively lit up in the bright sunshine. 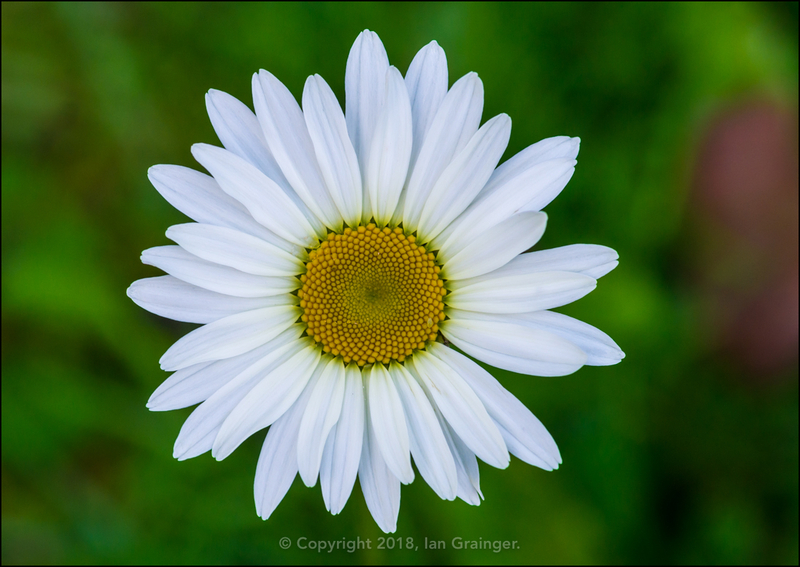 To my complete surprise, the Oxeye Dasies (Leucanthemum vulgare) were still flowering, and this one looked like it had only just popped open, the petals being as near to perfection as possible. 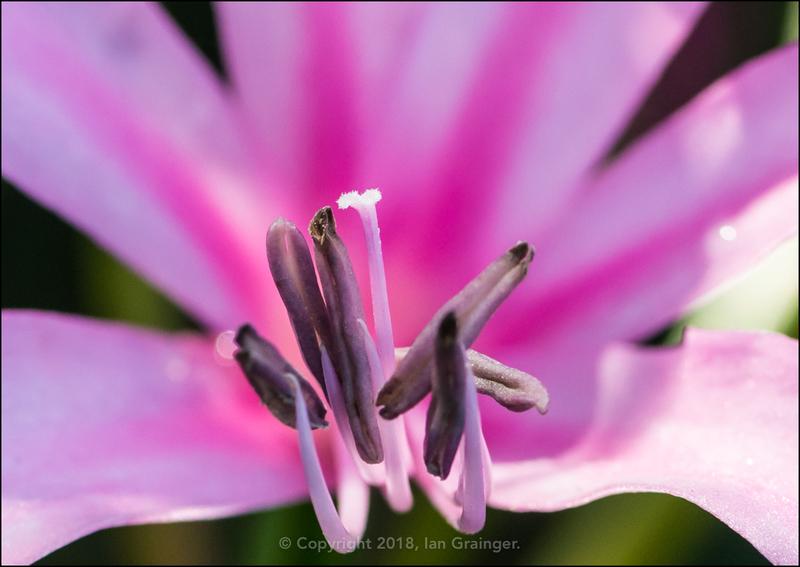 Examining the detail at the centre of any flower is fun, and zooming in close to the centre of a Nerine (Nerine bowdenii) bloom didn't disappoint. 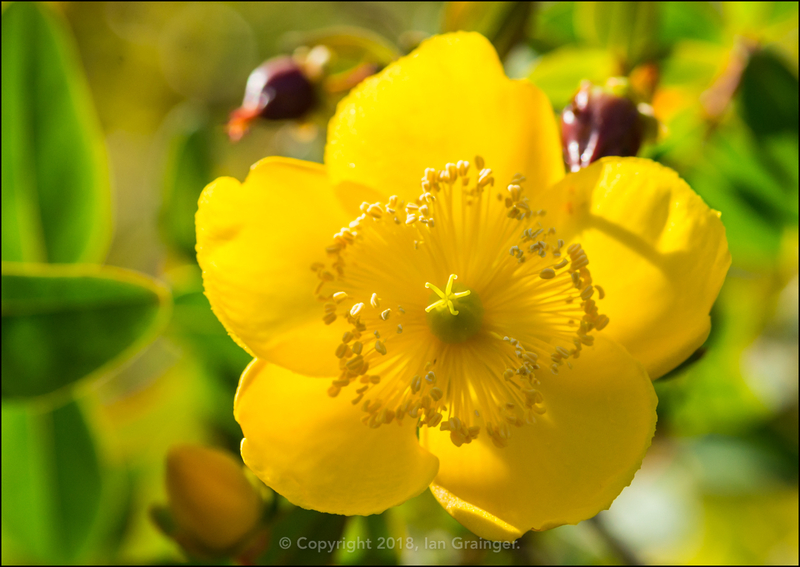 The Hypericum bush was still throwing out loads of early Autumn flowers, and they were all shining brightly in the morning sunshine. 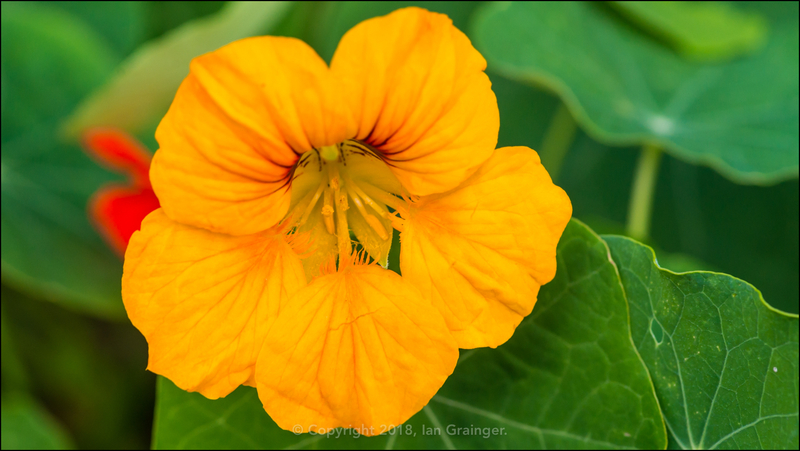 The late run of Nasturtium (Tropaeolum) blooms continued to appear, adding a lovely splash of colour to the fresh looking green leaves. 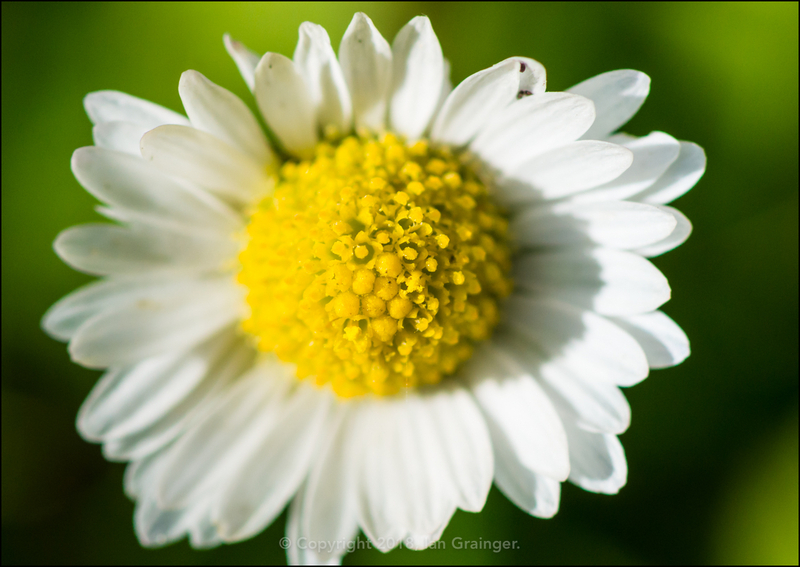 There seemed to be quite a few Lawn Daisies (Bellis perennis) showing in the front lawn, which made a nice change to the Moss and Clover that also take up residence there! 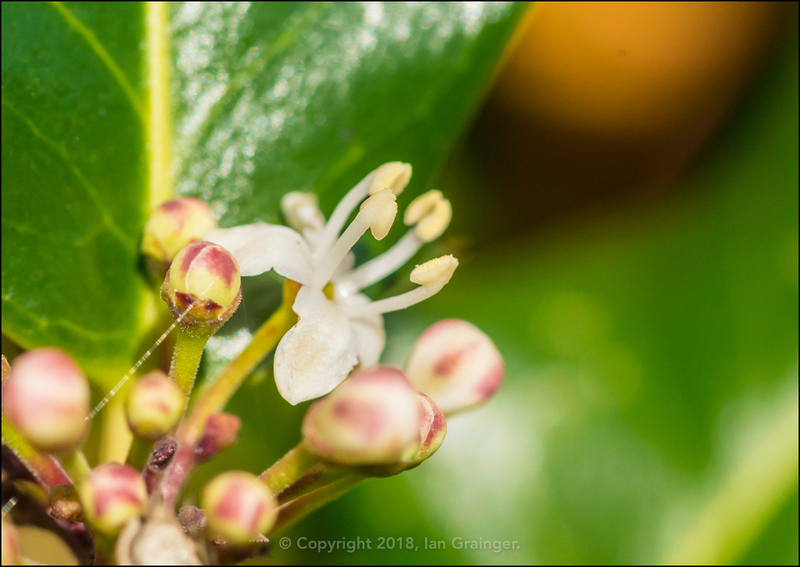 There were more Holly (Ilex) bushes beginning to flower, and I still had my fingers crossed that there were both male and female variants in the garden, so that we may see some berries later in the year. 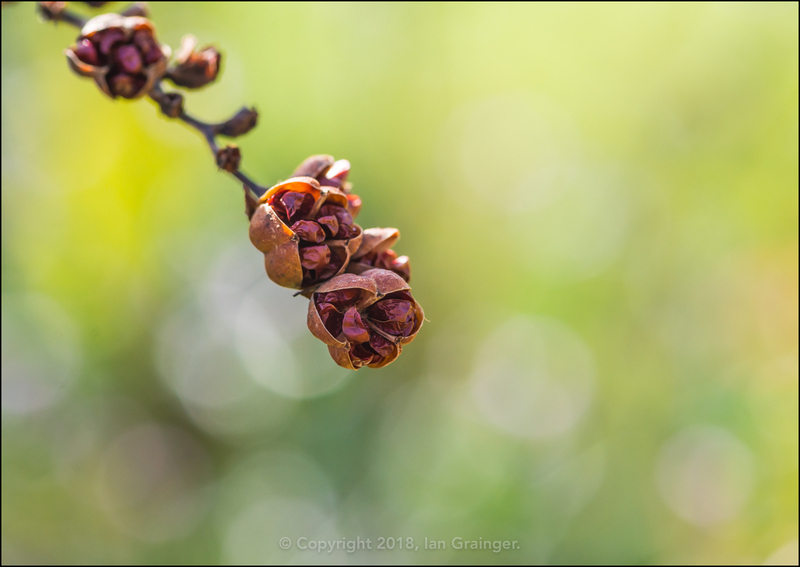 The Crocosmia 'Lucifer' plants continued to produce seed pods, and now they were opening up so you could collect the seeds. That would be a job for next week. 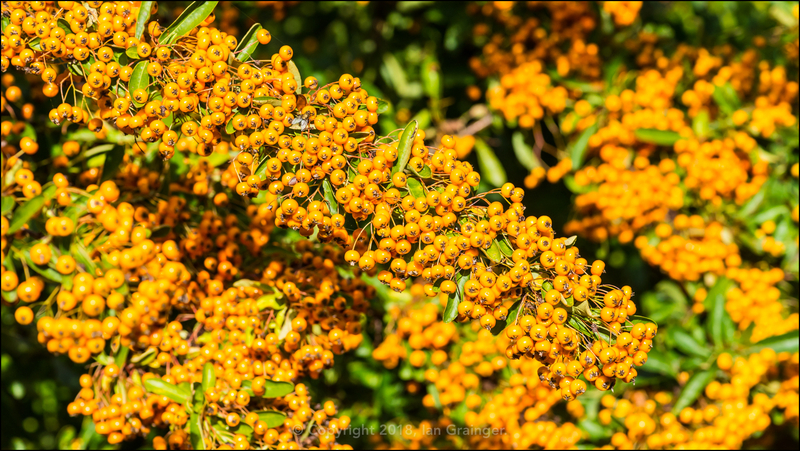 The berry laden Pyracantha bush continued to look fantastic, although the branches were beginning to sag under the weight of all of those ripening berries. 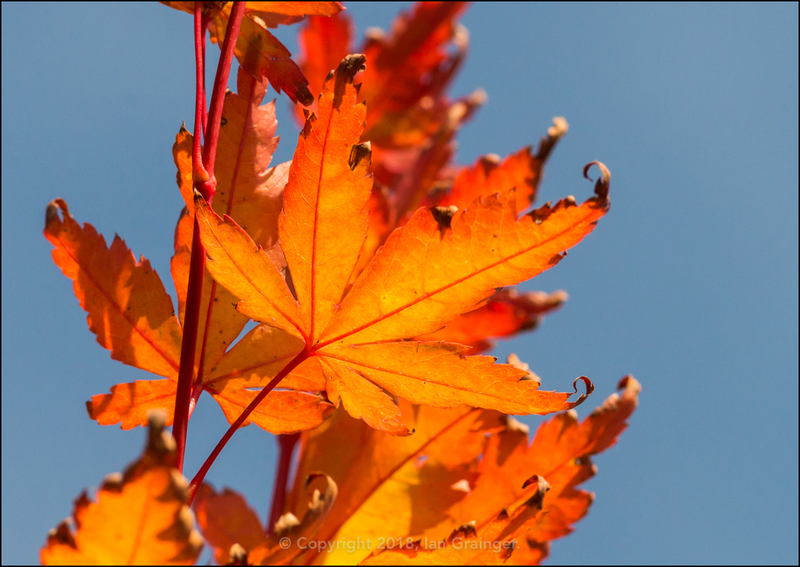 ...as did the combination of the blue sky and these golden coloured ones. 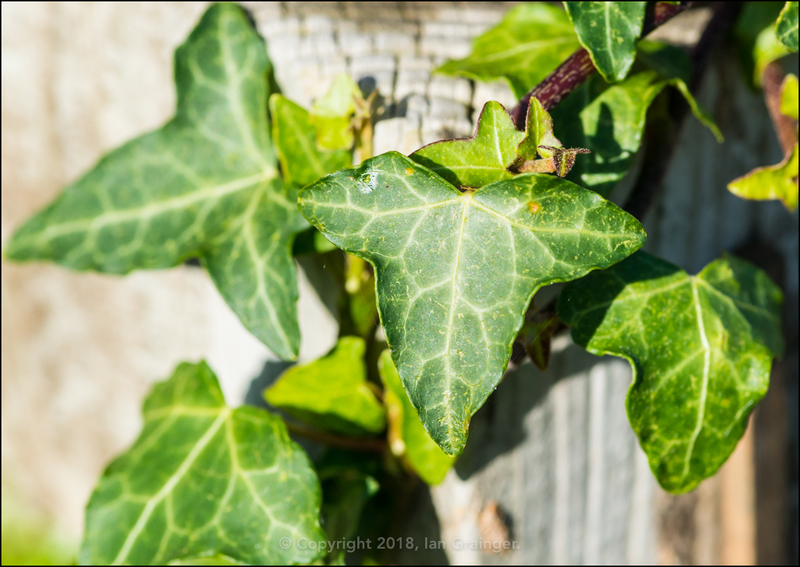 Some Common Ivy (Hedera helix) had begun to generate new leaves as its branches wound their way up a wooden gatepost. Unfortunately, there wasn't much wildlife around to shoot. 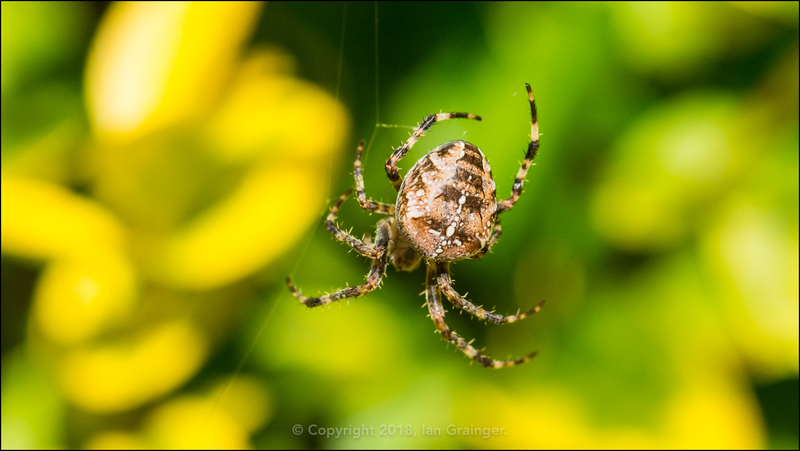 The only creature in abundance was the Garden Spider (Araneus diadematus), which had webs literally everywhere you walked. Finally my fishy friends. I had another dip into my photography archives this week to bring you this Auratus Cichlid (Melanochromis auratus). 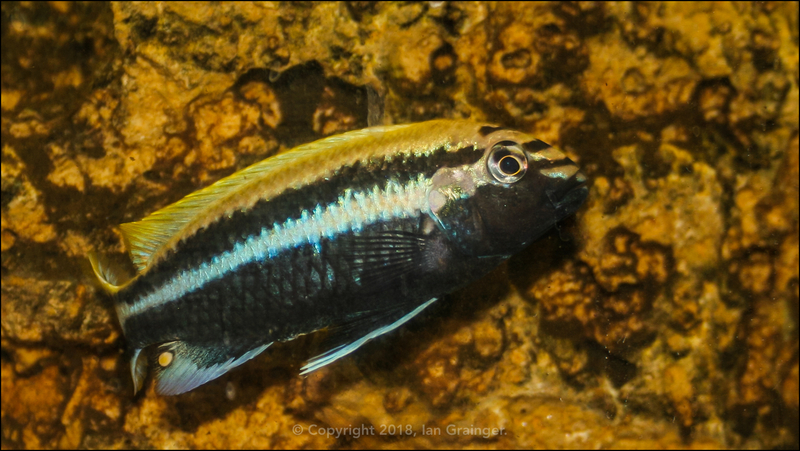 I had a few of these rock dwelling species in a Lake Malawi biotope aquarium. They were feisty fish! This was the dominant male, displaying a black colouration. Other males in the tank took on the female colouration of yellow to avoid too much aggression!